Autograph envelope, signed. 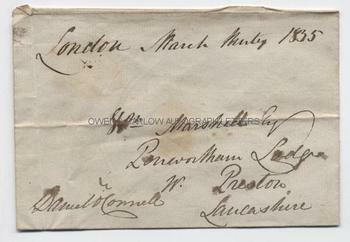 Dated and addressed in his hand "London. March thirty 1835. Wm. Marshall, Esq., Penwortham Lodge, Preston, Lancashire". Approx 5.5 x 3.75 inches. Some age toning and slight creases. Ink a little smudged when it was originally blotted by the writer. Daniel O'Connell led the campaign for the repeal of the Act of Union that made Ireland a part of the United Kingdom and he was also the leading voice in the movement for Catholic emancipation. Catholic emancipation became law in Britain in 1829 and Daniel O'connell was able to take his seat in Parliament in 1830. George IV is said to have complained that "Daniel O'Connell is King of Ireland and I am only the Dean of Windsor". Provenance: From the 19th century album of Emma Marshall of Penwortham Lodge, Preston. 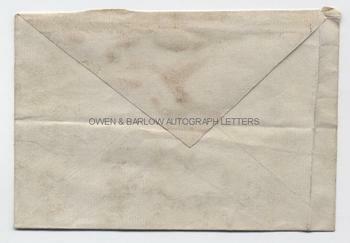 Emma was the daughter of William Marshall (to whom the envelope is addressed), land owner and cotton manufacturer.